A bathroom vent fan is a mechanical ventilation device that exhausts indoor air to the outdoors via a flexible tube or metal duct. A vent fan will draw out moisture and odors from the bathroom, improving air quality. Not only is it a good idea to install one, but many building codes now require it for new construction or when major bathroom remodeling is underway. Where a vent fan is required, the building code may have specific recommendations for matching the size of the fan—as measured by CFM (cubic feet of air per minute)—to the square footage of the room. Not all communities have this building code requirement, so check with your area. For example, in some communities, bathrooms that have operating windows may not be required to have vent fans. Even when not required, though, a vent fan is a good addition to any bathroom. Many people imagine that a bathroom vent fan serves the primary function of removing odors from a bathroom, but the more important function is actually to exhaust warm, moist air, such as that created from the use of a bathtub or shower. Warm, moist air not only encourages mold growth but also can cause damage to the fixtures and surfaces in a bathroom. 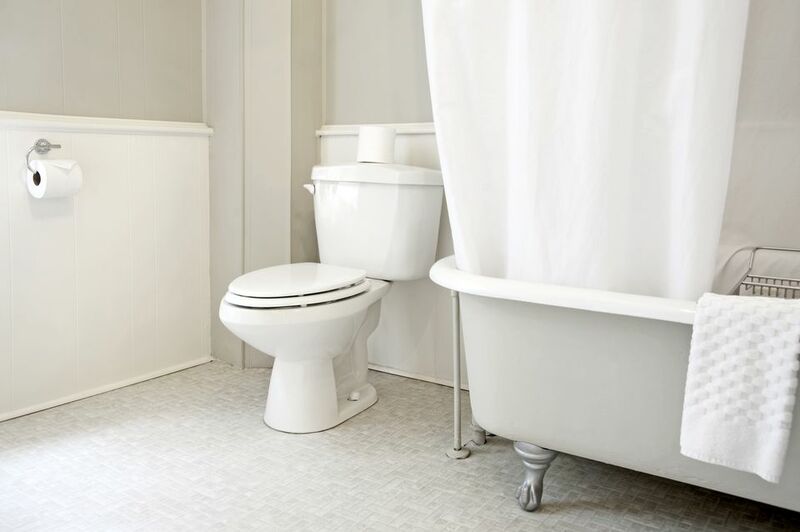 If your bathroom doesn't have a fan and it smells musty, you would be well advised to install one—and to check to make sure that a serious mold growth hasn't already begun. A vent fan is wired to standard 120-volt household electrical current, in much the same way as ceiling light fixtures are wired. The vent fan may be wired to the same electrical circuit that powers a light fixture. A wall switch operates the vent fan, and it may also have a timer that will allow the fan to continue running for a prescribed amount of time. When the fan is turned on, the air is drawn out of the bathroom through the fan enclosure and into a plastic hose or metal duct leading to a vent opening on the roof or sidewall of the home. A louvered coverplate protects the exit point of the vent, which keeps the duct closed when not in use. This vent cover is cut into the wall or roof and attaches to the outside with four screws and some silicone caulk or is covered by a flashed roof cap. Bathroom vent fans vary in styles and colors, and they may be standalone models that feature only the ventilating fan or combination units that include the fan as well as a light fixture or heat lamp. Now, there are even sophisticated models that incorporate Bluetooth capability and a speaker, allowing you to stream music wirelessly from a smartphone, tablet, or home media system. Pay attention to the sound ratings when shopping for vent fans. Although it might seem like a minor point, a loud fan can be quite distracting when you are trying to relax by soaking in the bathtub. Sound ratings of 1.0 or less are the best choice. One of the most important choices is to make sure the fan operates at a capacity sufficient for the size of the room. Vent fan capacity is measured by CFM (cubic feet per minute), the volume of air moved by the unit. Generally speaking, the greater the capacity the better, but it is possible for a vent fan unit to be too powerful for the space, which can create a negative pressure situation in the bathroom. This has the potential for interfering with the operation of furnace ducts or sucking cold air in through windows, so it is important to choose a vent fan unit sized appropriately for the square footage of your bathroom. Fans certified by the HVI (Home Ventilation Institute) have been independently tested and certified to meet specific industry standards. When chosen according to proper size recommendations and installed correctly, HVI certified fans are guaranteed to perform as promised. It is best to install the vent fan near the area where there is most moisture, such as over the sink or near the shower. In an open bathroom, you can position the vent fan midway between the shower/tub and toilet area. In a very small bathroom, centering the fan in the room is fine. Where the toilet is located in a secondary enclosure with a door, you may want to consider a second vent fan for this area. Make sure that the exterior vent louver operates correctly so that it closes fully when the fan is not in use. This will keep cold air from seeping back into the house when the vent fan is not running. Insulate around the flexible hose or metal duct that leads from the fan housing to the outdoor louvered cap. This will help reduce the loss of indoor heat to the outdoors. Do not tightly seal the gap beneath the bathroom door. Allow a 3/4-inch gap so that the air exhausted by the fan can be replaced. If the bathroom has extra-high ceilings (9 feet or higher), you may need a vent fan with extra capacity.